Memorial Day marks the unofficial start of the summer season, and many families will soon be heading to the beach. Sadly, it’s also the time when many children drown: An estimated 1,000 children fatally drowned in a single year in the U.S., most of them between May and August. In addition, more than 7,000 children are taken to the Emergency Room each year because of a drowning scare. Surprisingly, those drownings most often happen in lakes, rivers, ponds, oceans, canals, reservoirs, retention ponds and other open water. A ten-year-old, for example, is three times as likely to drown in open water than in a pool. And older teens are more than eight times more likely to die because of an open water drowning than a pool drowning. The good news: Our resources can help families keep children and teens safe in and around the water this summer season and beyond. 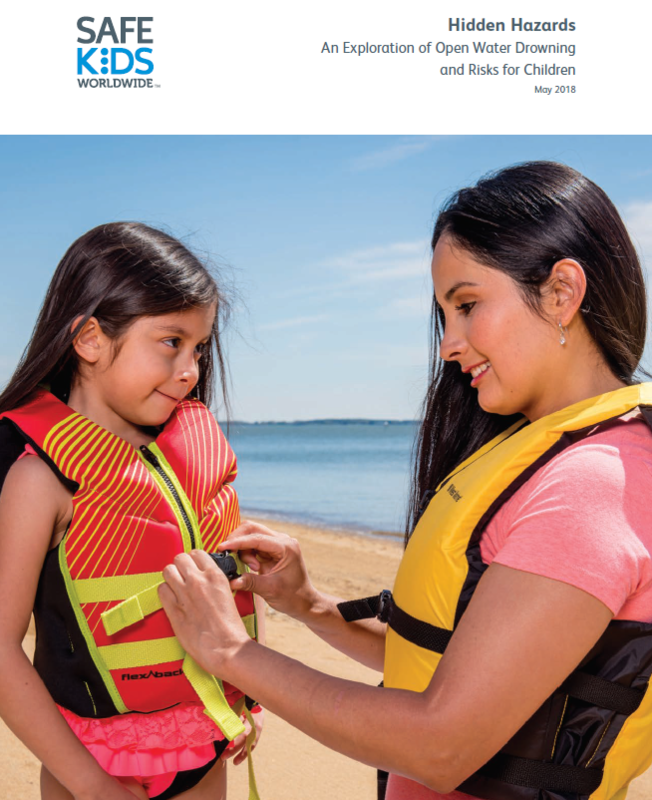 With the support of Nationwide’s Make Safe Happen program, Safe Kids Worldwide conducted new research to examine the risk factors associated with open water drowning among children and to explore the ways swimming in open water is potentially dangerous. The report, “Hidden Hazards: An Exploration of Open Water Drowning and Risks for Kids”, looks at who is at greatest risk of open water drowning. As far as gender, it’s boys: 8 in 10 open water fatal drowning victims are males. In terms of race and ethnicity, African American children are twice as likely to fatally drown in open water than White children. Children in tribal communities (American Indian/Alaskan Native) are at even higher risk. 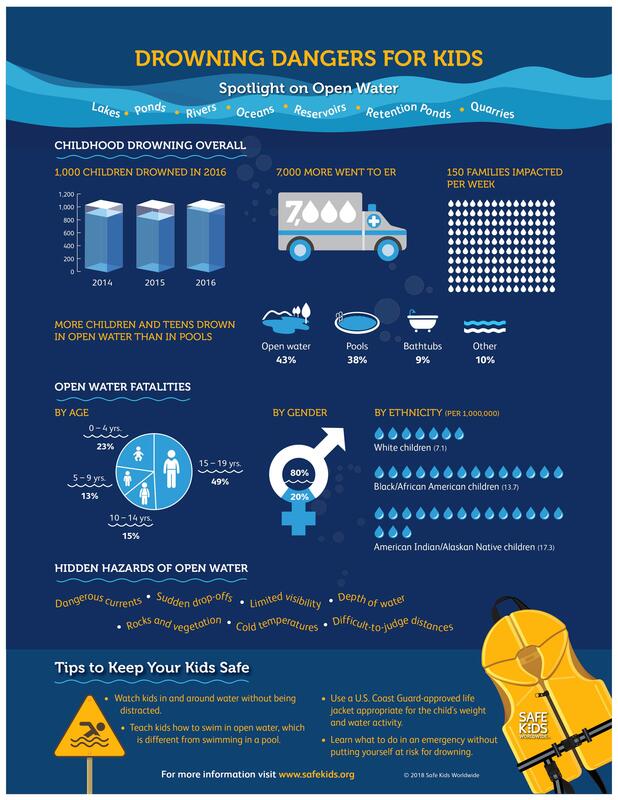 We’ve created an infographic highlighting the most important facts and findings about drowning in general and, more specifically, about open-water drowning. The information is presented here in a way that’s helpful and easy for parents and caregivers to read. Watch kids when they are in or around water, without being distracted. Keep young children and inexperienced swimmers within arm’s reach of an adult. Make sure older children swim with a partner every time. Make sure children learn how to swim. Every child is different, so enroll children in swim lessons when they are ready. Consider their age, development and how often they are around water when deciding if they are ready. Teach children that swimming in open water is different from swimming in a pool. Be aware of situations that are unique to open water, such as limited visibility, depth, uneven surfaces, currents and undertow. These potential hazards can make swimming in open water more challenging than swimming in a pool. Wear a U.S. Coast Guard-approved life jacket when boating or participating in other recreational activities on the water. Children should wear a U.S. Coast Guard-approved personal floatation device (PFD) appropriate for their age, weight and the water activity. For kids younger than 5, choose a PFD with head support and a strap between the legs. Use designated swimming areas and recreational areas whenever possible. Professionals have assessed the area, and there are usually signs posted regarding hazards and lifeguard schedules. Swimming in lakes, rivers, oceans and other open water poses hazards you won’t find in a swimming pool. Parents need to be aware of such risks as uneven surfaces, dangerous currents, cold temperatures and more. Our Safety in Seconds video tells families what to look for in a life jacket – sometimes called a personal floatation device or PFD. And it provides detailed instructions on how to get the proper fit so your child has maximum protection. You can find additional resources on water safety. Ask an Expert: How do I know if my kids are ready to swim in the ocean?